Burundi’s government is grappling with how to address growing demand for health care including HIV/AIDS. At the same time, the government is working to balance financial constraints, rising costs, and limited resources. Since 2013, USAID’s Health Finance and Governance (HFG) project has been working with Burundi’s Ministry of Health to strengthen national level leadership of the HIV/AIDS response. Specifically, HFG is supporting the MOH’s National HIV/AIDS Program (Programme de la Lutte Contre le SIDA et les Infections Sexuellement Transmissibles, PNLS) to strengthen its core functions in order to play a leadership role in the response to the HIV/AIDS epidemic, and the Ministry of Health’s Planning Unit to produce and use financial data more effectively. Burundi’s National HIV/AIDS Program (PNLS) was created in 2011 when the Ministries of Public Health and HIV/AIDS were combined. In its early stages, the organization tasked with leading the long-term implementation the Ministry of Health’s HIV/AIDS programs, lacked strong management and organizational capacity, resulting in weaker HIV/AIDS program outcomes. 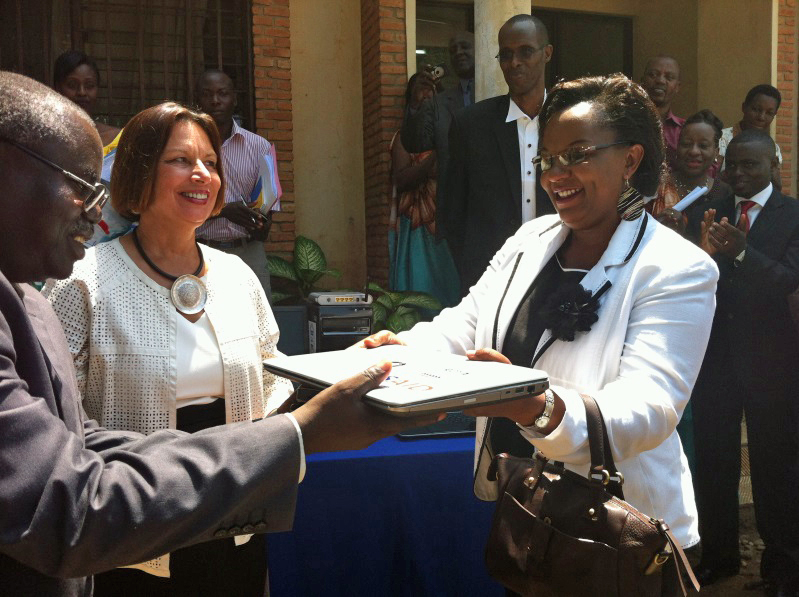 Minister of Health Dr. Sabine Ntakarutimana gives new IT equipment (purchased by HFG) to PNLS Director, Dr. Hilaire Ninteretse, watched by the US Ambassador to Burundi, Dawn Liberi. HFG’s assistance to PNLS has been aimed at improving its capacity to play its mandated leadership role. HFG has been working closely with PNLS since May 2013 to strengthen its capacity to carry out its core functions of strategy and planning, supervision, monitoring and evaluation, coordination, and training. In the first phase, HFG worked with PNLS to strengthen its underlying management capacity: developing a vision for PNLS, establishing the senior management team, improving leadership and management skills, creating effective work teams, and strengthening stakeholder engagement. In the second phase, HFG focused on building capacity to carry out the organization’s core functions: strengthening project management skills, improving planning and monitoring and evaluation capacities, developing a core group of technical trainers, and developing a national strategy for technical supervision. Support included training workshops and one-to-one coaching, followed by observation of skills application on concrete activities. With its newly strengthened core management capacity, PNLS developed its first annual operational plan that links to the National Strategic Plan for the Fight Against AIDS 2012-2016 (Strategic Plan). PNLS is using the Operational Plan as the basis for coordinating its stakeholders and negotiating resources for implementing the plan. PNLS has established a national level coordination mechanism that will monitor implementation of the operational plan. HFG also worked with PNLS to develop a stakeholder engagement strategy to help them work more effectively with the many partners involved in the national HIV/AIDS response. Results from a survey of PNLS staff showed progress in the five core functions as a result of HFG assistance. The impact of HFG’s capacity building activities with the PNLS was even more clear with the selection of PNLS as the public Sector Principal Recipient for the new Global Fund grant for HIV/AIDS. For the first time, PNLS will receive direct funding from the Global Fund to support its leadership and management of the national HIV/ AIDS response. HFG has supported the Planning Unit and PNLS to produce and use health financing data in order to improve programming. HFG helped to cost the Elimination of Mother-to-Child Transmission (eMTCT) plan, in order to understand the resources required to achieve eMTCT targets and the financial gap. The costing exercise was used to update the National Strategic Plan for the Fight Against AIDS 2012-2016 during its mid-term review in 2014. HFG also worked with the Planning Unit of the Ministry of Health to support Burundi’s 2012 and 2013 Health Accounts (HA) exercises. The exercise included a strong capacity building component wherein HFG strengthened the unit’s knowledge of the international framework used to produce Health Accounts (System of Health Accounts 2011), and shared best practices for Health Accounts estimation. Up-to-date data on health spending provides a strong evidence-base for the Ministry of Health to make informed decisions about raising sufficient funds for the health sector, improving resource allocation, and helping to ensure more affordable health care for Burundian households.